The realm of facials has certainly changed even within the last five years. At both Inspire Day Spa and New Serenity Spa in Arizona, we pride ourselves on giving our customers the very best when it comes to facial treatments. Whether you’re searching for facials Phoenix or a facial in Scottsdale, our hope is that in coming upon our website you will love what you see. What’s more, you’ll be able to feel what the experience is like vicariously. And thus be prompted to book your appointment. Facials are so important to what we do and how we serve our clientele, that we make it a point to keep coming up with even better protocols and better treatment options. Two of our most popular facial treatments are the LeClair organic facial and our signature Inspire facial. When our guests come in for either of these, they inevitably leave feeling absolutely refreshed, relaxed, and enjoying how smooth and supple their skin now feels. The key is to focus on hydrating and polishing this skin. The aesthetician accomplishes this by first performing a thorough cleansing of the face and decollette. An exfoliation follows designed to remove dead skin cells and debris from the surface of your complexion. You will also receive a face a massage, as well as an ultra relaxing arm massage during this process. The Inspire facial combines both eye and lip treatments to help firm up and moisturize respectively. It is no wonder that so many clients request this specific spa treatments. You get to relax, have tighter firmer looking skin, and also enjoy the benefits of certain massages. Among our very newest offerings, is the LeClair organic facial. Designed by our very own spa owner, this treatment uses all natural, organic products to give you a fresher and rejuvenated complexion. 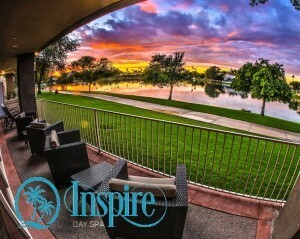 As with the Inspire facial, you also get the tremendous benefits of being able to completely relax. It begins with soothing oil cleanse as well as a deep foam cleanser used to get rid of makeup and debris. In an effort to thoroughly exfoliate, you will then receive an enzyme mask; this helps to purify. In conjunction there is then a warming paraffin hand treatment. Once the mask comes off, a toner goes on for a deep pore cleansing. You will also receive a hydration mask to bring added volume and smoothness. Warm towels go on your feet and you get an amazing leg massage. We do a hyaluronic refresher as well as eye treatment pads. After a lip exfoliation and moisture treatment, you receive a final hydration and all-day overall moisture treatment. This combines many different elements, all geared toward enabling our clients to relax and feel like their very best selves.